The 10 Best Pubs in New Mexico! Pubs are a place of comfort. It’s a hangout where friends meet up and a place to make new ones. The beer is cold and the food consistently hearty and the hospitality inspires that feeling that you’ve found your favorite place. Here are the 10 best pubs in New Mexico. Good beer, good food, good company. That’s what makes a great pub. This one’s in that catego-ry. Whether you like beer in a pint, a mug or a bottle you’ll find plenty to drink at this refur-bished 100-year old brewery in the heart of town. 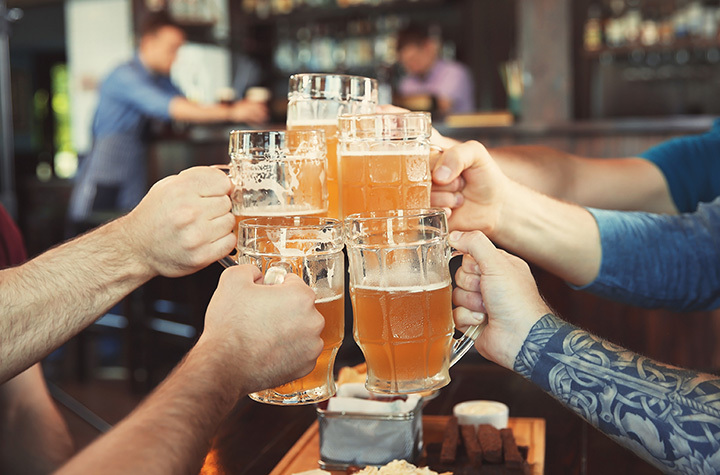 Traditional pub fare includes bratwurst, burg-ers, fish and chips, beer battered sandwiches and New Mexican specialties like burritos and green chile stew, which goes well with the green chile beer. Enjoy live music in the beer garden or outside on the patio. Vegan, vegetarian and gluten free food options. Don’t be fooled by the name of this pub, the two “fools” who run it know what they’re doing when it comes to beer. They’ve recreated an authentic Irish pub, complete with the ales, stouts, fine whiskies and culinary fare of the beautiful Emerald Isle. There’s popular beer on tap like Magners Irish cider, plus those brewed from a wide-range of states and countries and, of course, Guinness. Pub food is traditional: scotch eggs, fish and chips, Guinness beef stew, Ploughman’s lunch and cottage pie are just a few of the highlights. Of note, they also have the largest whiskey selection in the Southwest. Locally crafted beer made on-site is what’s on tap here. Lager, ale, stout, a Hefeweizen and West Coast inspired IPA are tasty by the pint or try a variety by the flight. Many are only offered on a seasonal basis so taste it while you can. The food, made with locally-sourced ingredients as available, is hearty, from the beer cheese pulled pork nachos to the falafel waffle sandwich to the green chile bacon cheese burger and the assortment of pizzas. Happy hour daily from 3 to 6 p.m. with discounts on food and beer. Craft beer made by the Sierra Blanca Brewing Co. is the star here. You’ll also find their own Rio Grande Brewing Co. brand too, as well as stout, lager, IPA and a variety of domestic beers. You can get it to go by the six pack, case and refillable growler. Accent any meal with a flight of dif-ferent types. Food covers the range of customary pub fare with grilled meats, burgers and sand-wiches, soups and salads, pastas and an interesting selection of starters and desserts. A nice wine list for the wine lover, too. If you’re not sure what to order here, ask for a sample. Staff is happy to accommodate the re-quest. One of the State’s largest breweries, the brewmaster has mastered the art of craft beer making, earning awards at the Great American Beer Festival and the Brewing News National IPA Challenge. On tap every day is an oatmeal stout, scotch ale, amber ale, a signature IPA and lager. There are specialty beers that pop up periodically with names like Center Fielder Extra Pale Ale and Desert Kaleidoscope. The menu is inventive. Try the duck confit eggrolls or green chile falafel or the Thai style mussels. Happy hour specials every day. If you’re stopping in town for a bite and a beer, look for an old-fashioned building that looks like the town’s original general store. That’s the Brew House. Step inside, this refurbished historic building is a microbrewery treasure. Beers and ciders are made on-site by the Grant Brewing Company. With 10 taps, there’s a lot to try from ciders and wines to non-alcoholic seasonal sodas and, of course, New Mexican beer. Eat before you go since food isn’t served here yet. This brewery is second in name only. It was the first within the city limits. It was voted Best Beer Brewed in Santa Fe and Best Local Tap Room. All serving staff pass a certification that qualifies them to answer questions about beer, beer styles and how the beer is brewed. The beer menu is huge—you’re sure to find something you like. Burgers, sandwiches, wraps, salads, appe-tizers and entrees like Northern New Mexican style enchiladas and live music make this a great night out. All the beers at this pub are hand-crafted by the brewmaster on the premises, and there’s a great selection. An Indian Basin Wheat is a blend of American and Belgian beer styles. Try the pale or Irish Red ale or a smooth American-style stout. Or, get a taste of three with a sampler. Any of the beers pair well with the pub food. Of course, burgers and sandwiches, fish and chips are favorites but take a walk on the wild side with an elk bratwurst or bison burger. Specials Monday through Saturday. A historic experience in a landmark building. This may not be a micro-brewery, but the owners have captured the brew pub atmosphere, a friendly hangout where the beer and food shine. You could try a different beer every week— there are 52 to choose from. Some are on tap and some are craft brews. The fare is a mix of Mex-ican and American comfort food with a wide-variety of appetizers, soups and salads, barbecue and mouthwatering entrees that focus on steaks and fish. All sandwiches come with a choice of red or green chili as an add-on. Enjoy live music weekly. Not far from the bustle of the big city, you’ll find this small town hanging on to its rural roots. The Bistro supports that by encouraging customers to make themselves at home. With a beer in hand, one of 12 on tap, a make-your-own-burger meal and a few friends it’s just like a home-away-from home. The Brewery also makes its own beer, seasonally, that includes a Belgian farm ale, a stout and an IPA. The menu boasts a selection of roasted meats, cheeses, salad and vegetar-ian dishes. View more New Mexico Bars and Saloons.